James Bond is set to own the Sony Xperia Z5 in his next outing, and a new ad promoting Spectre shows how he can't even be bothered to go and collect the phone himself. Instead he sends Moneypenny along and it's more stressful than queueing for a day one iPhone 6S. Ever since Dr No and that can of Red Stripe, Bond has been all about product placement. Sony is once again taking its opportunity to put its new phone in front of millions of eyes by getting Daniel Craig's Bond to brandish it alongside his Walther PPK. An ad - that you can watch here - leading up to the release of the Xperia Z5 and Spectre shows how even Bond himself doesn't seem that fussed about it. It's directed by Danny Kleinman, the brains behind the title sequences for Goldeneye, Tomorrow Never Dies, The World Is Not Enough, Die Another Day, Casino Royale, Skyfall and even Spectre. Let's hope the film isn't anything like this though. There are some really awful moments and we feel quite sorry for Naomi Harris as she was contracted to do this. Everybody loved the new telling of Moneypenny in Skyfall – no longer will she sit behind a desk and be flirted with, she'll now do it in the field in a Jeep brandishing a sniper rifle. So what better time to re-introduce her to the field? An advert, of course. Come on Sony, that's not doing such a badass character justice. But it's happened, so let's get to it. 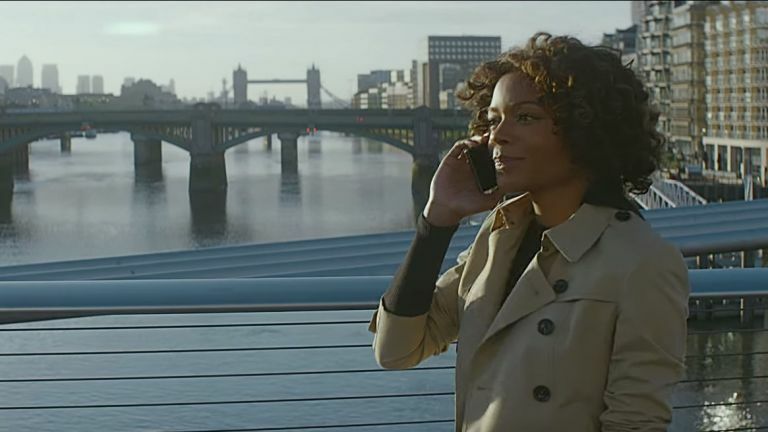 We kick off on the side of the River Thames, as Moneypenny awaits a drop from a contact. Slow-motion pigeons and all as if it is an English telling of a John Woo movie. Then we get a quick shot at her first gadget. No it's not an exploding pen, it's not a phone that controls a car… it's Sony's new RX100 IV camera. Moneypenny swoops in and takes the package she needs – I wonder what's inside the box? It's probably something to do with Spectre… right? The guy who dropped it is then rushed at by some burly men and searched for the package. Remember it was in a briefcase…so why are they going through his pockets? Time for a quick jog across London with a few sights such as the National Theatre, a living statue and this confused looking white van man. Classic bit of Bond onlooker comedy. Hey look, it's Naomi Harris – because for some reason she's been hiding her face until now.. But she has an idea. Let's unlock the briefcase. Oh my god. It's Bond's greatest gadget of all – the simple mobile phone. But this one is the Xperia Z5 and the best Sony has to offer. Let's hope this isn't the actual retail box for the phone because that is BIG. She then proceeds to turn all the lights off with a quick smash of the package and she uses her new gadget in low light to spot the bad guys. Then Moneypenny walks away, using the phone for a more traditional purpose. She's phoning Bond to tell him to pick up the phone himself next time…because he couldn't even be bothered himself. Even though this ad is awful, we quite like the Xperia Z5 series.